Construction work began in autumn 2015 and was completed in autumn 2018. During this time, performances continued in the main auditorium. Who designed the Open Up project? 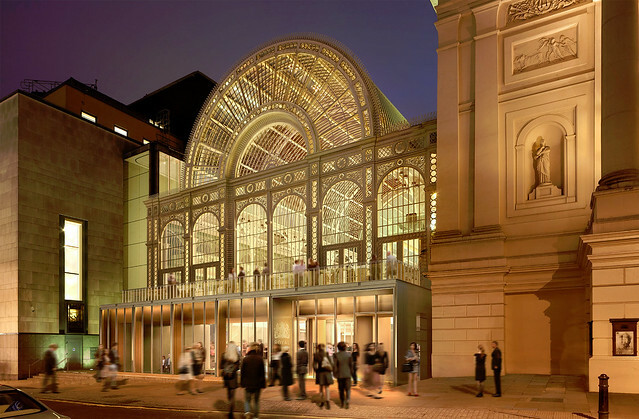 Following a high profile international competition, Stanton Williams were selected to carry out the Royal Opera House ‘Open Up’ project in February 2013. Is there contingency built into the timetable? A lot of work has gone into understanding what the risks are to the programme of performances and mitigating them where possible – for example, through extensive survey work. In addition there is contingency built into the programme for discovery items. Were the number of general rehearsals and matinees and performances affected by Open Up? No, the number remained the same. The construction programme was created around scheduled rehearsals, matinees and evening performances. Will any of the building work have a detrimental impact on the quality of performance or audience experience inside the main auditorium? No, except performance start times may vary – these changes will be made clear on all tickets and on the website. How will you cope with an increase in visitors to the building? While we aim to encourage more people to use the space, the new layout aims to make the foyers much less congested and should improve the visitor experience. For example, by including dedicated cloakrooms at Amphitheatre and Linbury levels as well as the ground level foyer cloakroom, we hope to reduce queuing times at the end of performances and avoid crowding around key circulation areas. What do you think will encourage visitors to spend more time in the building? Does the new design respect the listed building? Yes. We have been and continue to be in close consultation with English Heritage and Westminster City Council to ensure that this is the case. Does the new signage use a style that is considerate of the old building? Yes. Our signage and way-finding consultants were appointed to review signage across the building, not just Open Up areas. Will there still be standing places? There will be a variety of ticket prices available for both standing room and seated. The number of standing places is slightly reduced, but the comfort of the seating and quality of the sight-lines and acoustics will be improved dramatically, providing an all-round better experience for visitors. All of the funding for Open Up has been secured from a small number of private philanthropists and charitable foundations who have long-term involvement with the Royal Opera House and share its vision for this important project. We did not seek any public funding for the project.